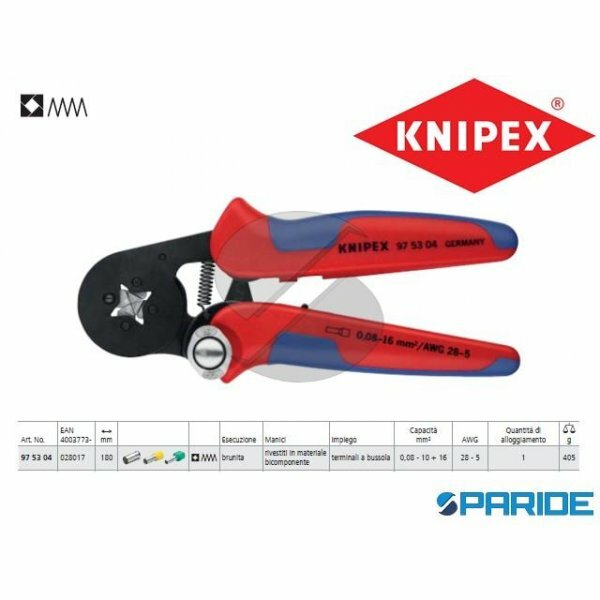 PINZA PER CAPICORDA 97 22 240 KNIPEX. 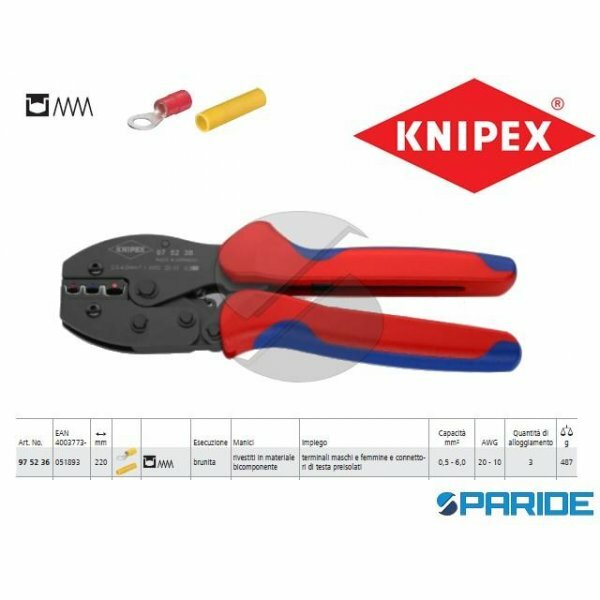 PER TAGLIARE CAVI, SPELARE FILI E SERRARE TERMINALI MASCHI E FEMMINE PRE-ISOLATI E NON ISOLATI CON FORI PER TRONCARE VITI FILETTATI IN RAME E ..
PINZA PER CAPICORDA 97 71 180 PER SERRARE TERMINALI A BUSSOLA KNIPEX. PINZA A TESTA PULITA CON MANICI RIVESTITI IN RESINA SINTETICA. 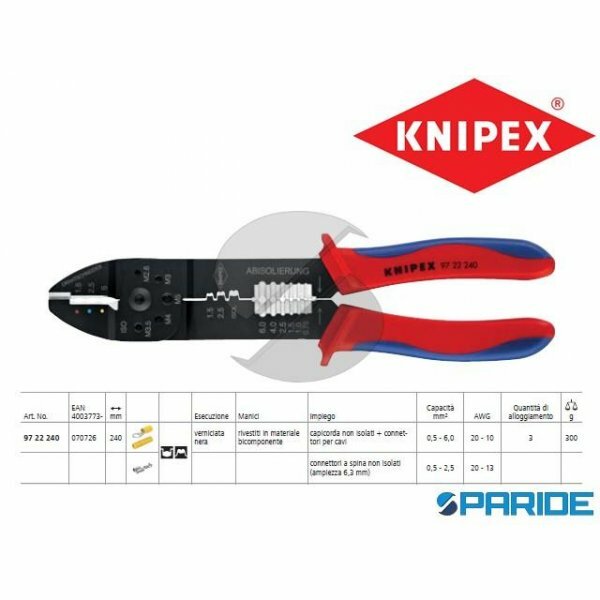 CRIMPAGGIO SEMPLIFICATO GRAZIE AL RAPPORTO DI T..
PINZA PER CAPICORDA PRECIFORCE 97 52 36 KNIPEX. PINZA BRUNITA, MANICI RIVESTITI IN MATERIALE BICOMPONENTE. 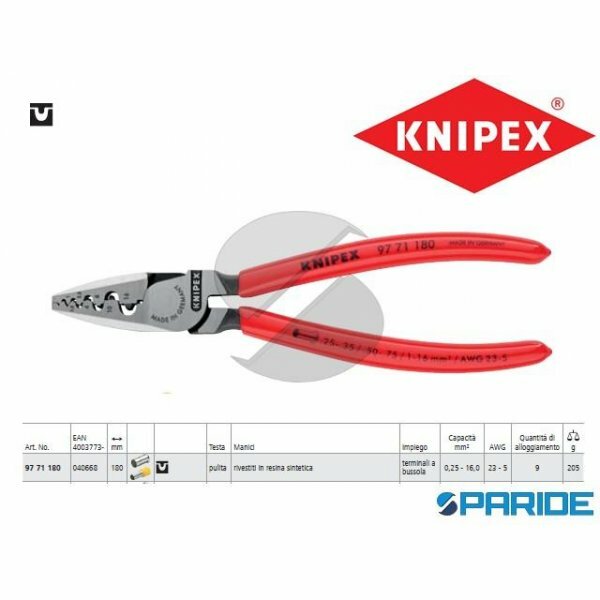 QUALITA DI CRIMPAGGIO COSTANTE TRAMITE PROFILI DI PRECISIONE E DISPOSITIV..
PINZA PER TERMINALI A BUSSOLA 97 53 04 KNIPEX. PINZA BRUNITA, MANICI RIVESTITI IN MATERIALE BICOMPONENTE. MINORE AMPIEZZA DI PRESA; PER SERRARE TERMINALI A BUSSOLA SECONDO DIN 4622..